One of the best restaurants in Barossa Valley in the Tanunda region. The food was delicious and made from fresh, local produce. 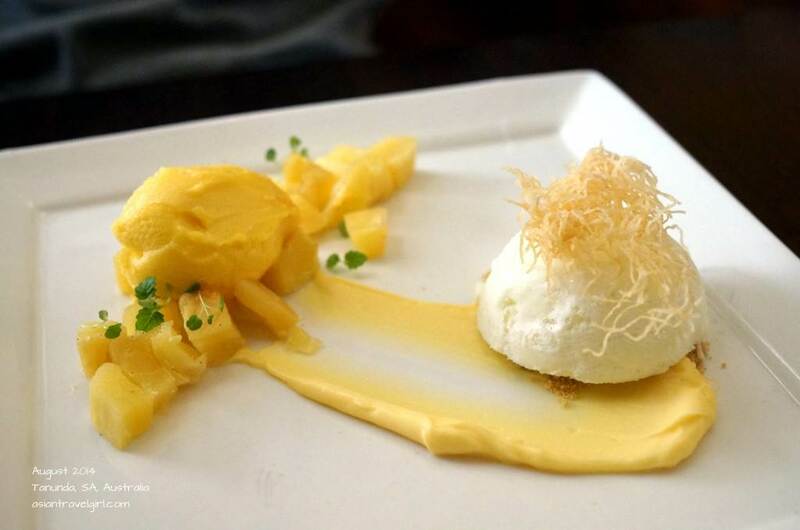 The dessert was worth a mention, we would love to come back and try out more! After our morning visit to Barossa Chateau at Lyndoch Hill, Lyndoch Bakery and The Whispering Wall at Barossa Reservoir, we finally reached our lunch destination- 1918 Bistro and Grill. 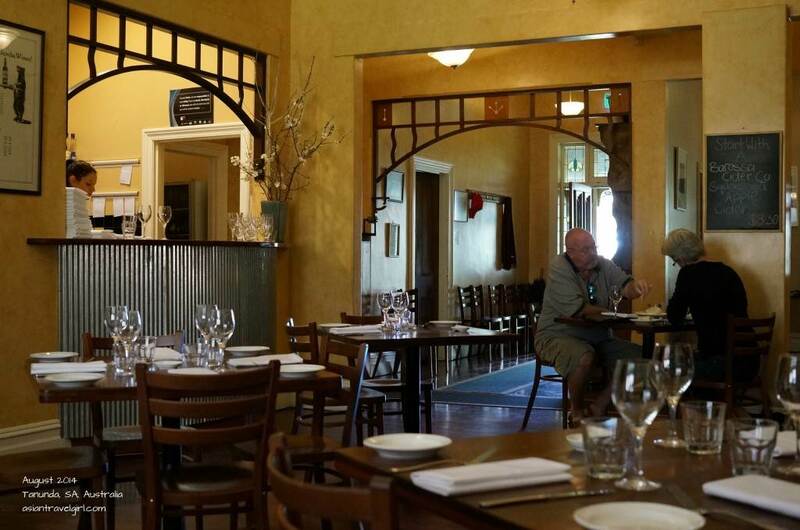 This Restaurant is located in one of the major towns of Barossa Valley- Tanunda. 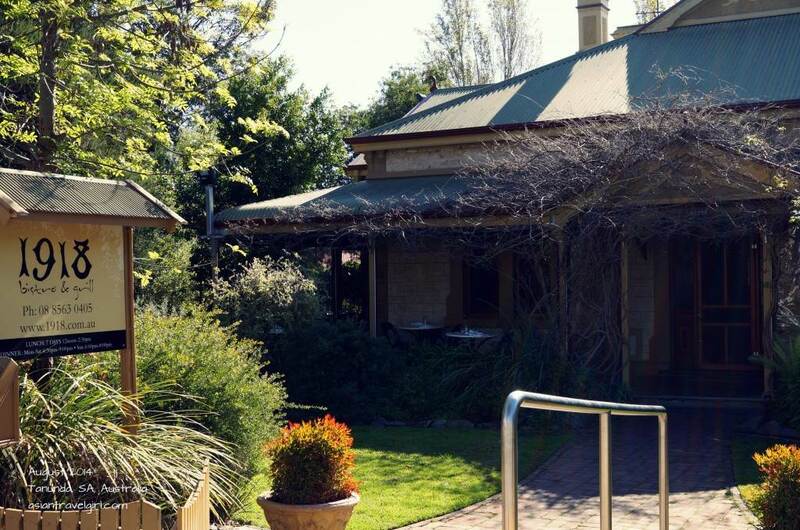 The restaurant was a family home back in 1918, in 1992 it turned into Barossa’s first bistro and grill. It is now under the management of the new owners from 2005. The weather was lovely outside, we initially sat outside in the front courtyard. 10 minutes later, I could feel the sun burning on my neck. I told York I want to move inside since I don’t want to get a sunburn. The waitress was very understanding, cleared our table very quickly and moved us to a window seat inside the restaurant. Apparently this place is famous for their desserts, plus we already had a pie each at Lyndoch Bakery, so we just ordered 2 mains to start. 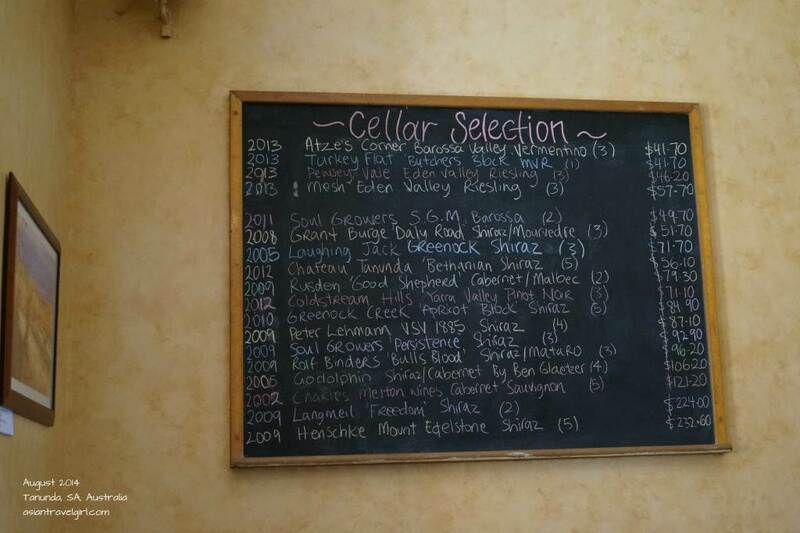 Since we are in a wine region where wine tastings are free, we didn’t see the need of ordering wines (I think we only ever ordered wines during our first and second date). I am sure the waiters here will have an extensive knowledge about wines though. It didn’t took long for the mains to come. 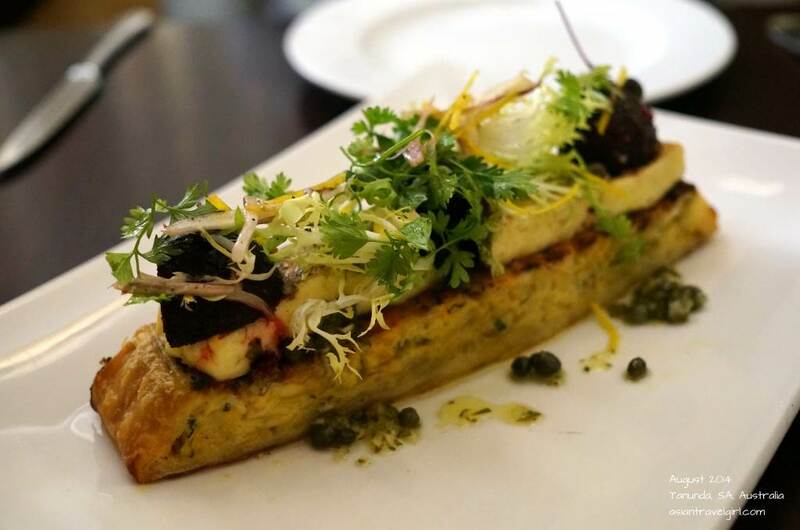 We ordered “Barossa Haloumi: leek & caramelised onion tart, salt roasted beetroot, lemon & caper dressing (AUD$28)” and “Fusilli Pasta: braised lamb shank, green peas, cherry tomatoes, broccolini, pecorino cheese (AUD$29)”. 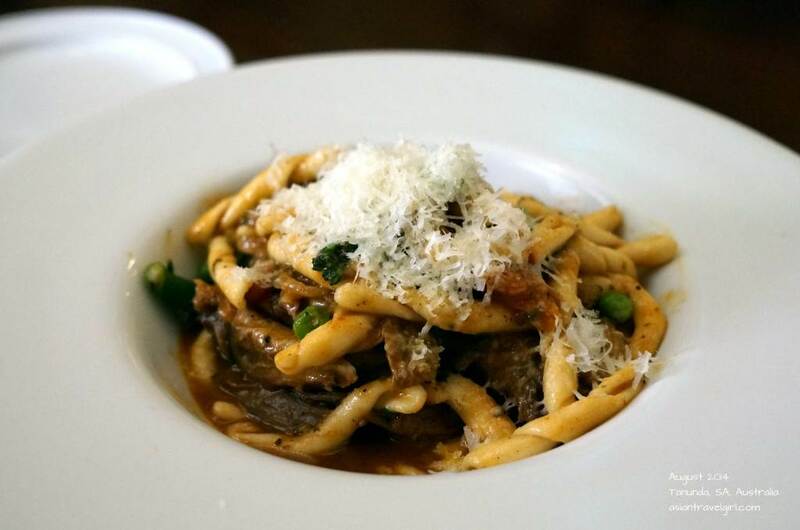 The Fusilli pasta seemed like hand-made and the braised lamb shank melts in your mouth. The portion was slightly small, however it was just right for desserts afterwards. Barossa is not only famous for its wines but also cheeses. The haloumi had a tinge of red inside, which I wasn’t sure what it was. However it was beautiful and chewy in my mouth, love the texture of haloumi cheese! The leek & caramelised onion tart tasted like a quiche. The flavors are still slightly strong for me, but it was a good dish. The most exciting part of the meal for me was finally having my hands on the dessert menu. Not only their desserts look delicious, they also have a huge selection of liqueur coffees, unfortunately my skin hasn’t been tolerating well with coffee, so I can only go for the normal desserts. York ordered “Yoghurt & Lime Parfait: gingerbread crumble, pineapple confit, mandarin sorbet (AUD$14)” and I had “Passionfruit Brule: strawberry sorbet, sable biscuit, vanilla fairy floss (AUD$14)”. This time York’s dessert choice was better than mine! I am not usually a fan of parfait but this yoghurt and lime parfait was so refreshing, I couldn’t stop eating it. It mixed well with the gingerbread crumble on top. 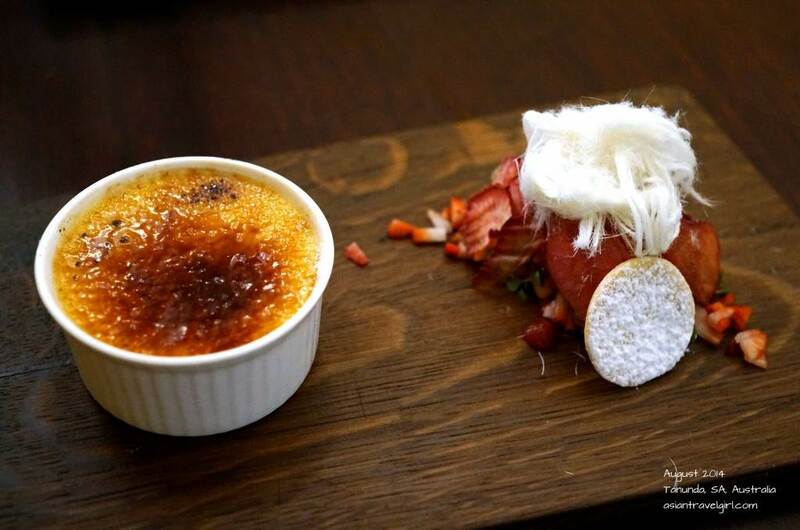 My passion fruit brule was very nice, the texture was really smooth inside and slightly warm. I love the vanilla fairy floss, it was soft but slightly crunchy in my mouth. Both mandarin and strawberry sorbets were house-made, they didn’t add too much sugar it in. I am sure most of the sweetness came from the fruits. I must agree the best part of the meal were the desserts. I would love to try their other dessert selections, such a pity this place is too far away from where I live. I think this is one of the highest rating restaurant in the region, so for people who are staying at Tanunda and visiting the wineries, this place would be perfect for dinner since it opens till late.